Maintenance time. One of the side benefits of motorbike ownership are the odd bits of maintenance which need doing. You can get a garage / shop to do these bits of course, but quite a few checks and changes most people can do themselve. Even I can. One thing which I’ve been wanting to do for a few weeks was to replace the air filters since they were due and it’s a simple task. What’s been annoying is that since I bought the new filters on Amazon JP, every day has been rained out. On my CB400SF, it’s simple, and takes about 15mins, unless like me you were cleaning other parts since I had access, and most importantly, drinking tea. Firstly, unclip the fuel hose just under one side of the tank, and then unclip a cable on the other side. You then have to remove the seat, and a couple of plastic panels, which are both held on by single screws – these cover the coolant tank on one side and some electrical cabling on the other on my bike. Then, remove the main bolt under the seat, and lift that whole fuel tank off. I always think the bike looks really odd without the tank. As you can gather, this isn’t a how to – there are plenty of good examples of those on YouTube and other places, and I doubt I could add anything beyond pauses to drink tea and to answer questions from passing kids about why the bike looks odd. 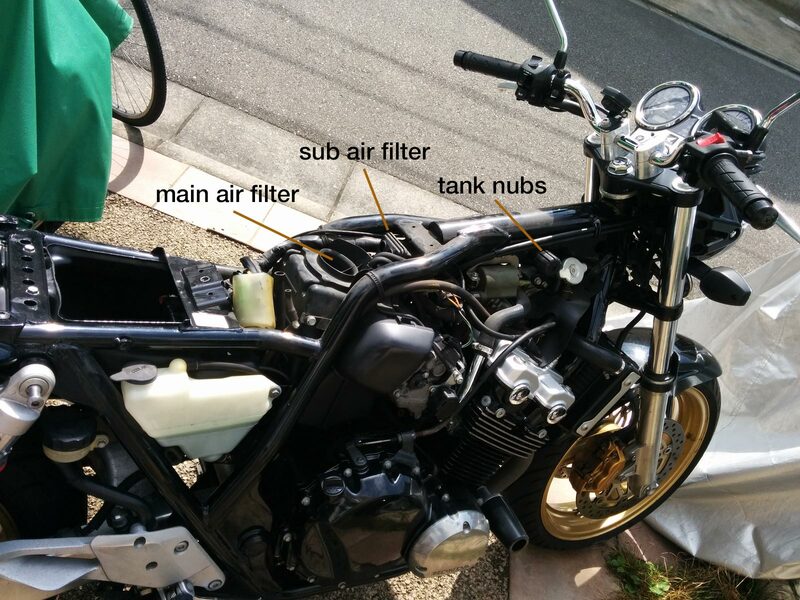 On the photo below, I’ve clumsily labelled the main air filter and the smaller filter. After you’ve replaced those you can give it all a quick clean and reverse the process – just remember to get the tank sat correctly around the 2 nubs on the main frame, and not on top, though it’ll be obvious when you’ve gotten it wrong. The second photo shows the old and new. I don’t have a picture of the sub-element as it somewhat fell to pieces when I I removed it, which shows it was definitely time to be done. 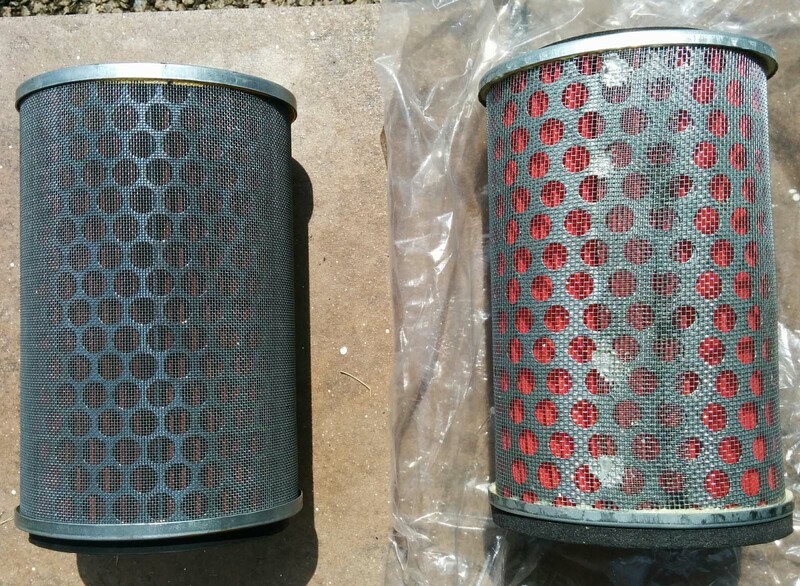 So that’s another job done, and this post is to remind me and anyone else to not forget the unsung air filters, and that it’s so simple even I can do it myself.